Android phones have had wireless charging for a while and Apple finally decided to release an iPhone with this capability. With the launch of the iPhone 8, iPhone 8 Plus, and iPhone X, Apple now supports wireless charging, and with the recent release of iOS 11.2, it now supports charging at 7.5 Watts. 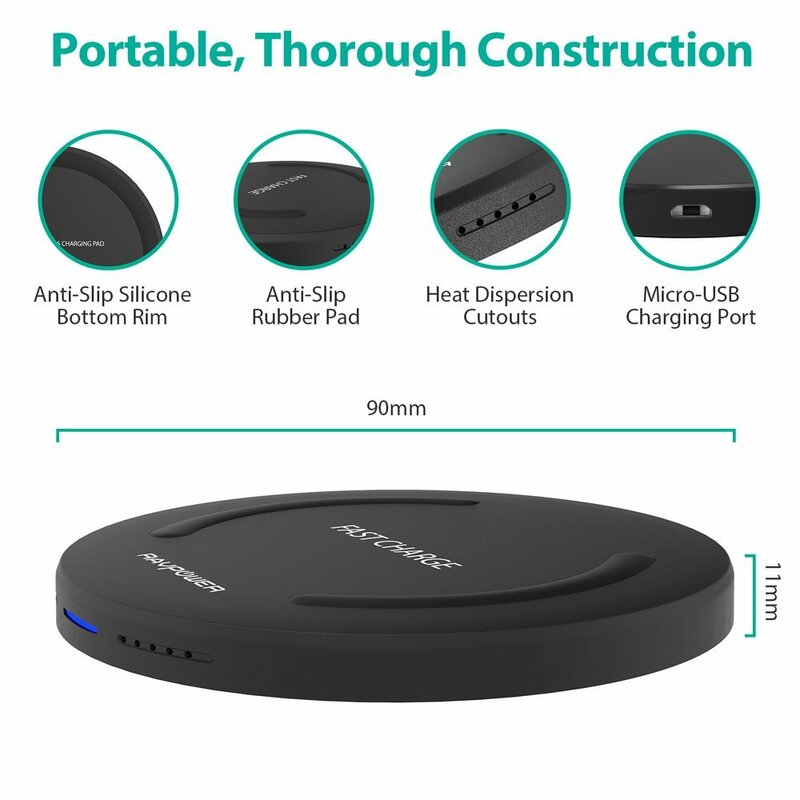 There are a number of expensive wireless chargers on Amazon, but I wanted to give this $17.99 RAVPower Quick Charge Wireless Charger RP-PC014 a go since it is reasonably priced and says it supports charging up to 10W. The RAVPower Wireless Charger comes with the charging pad, a manual, and a micro USB cable. You’ll need to use your own USB plug or car charger, and in my case, I’m using an iPad power adapter since it offers the higher watts needed for faster charging. The 7.5W charging is faster than the 5W the iPhone 8 supported at launch, but it is still slow compared to charging with an iPad adapter and lightning cable. I actually purchased two of these wireless chargers and I keep one on my nightstand and one on my desk at work for convenience. Since the newer iPhone also don’t come with a headphone jack, I can plug in my lightning headphones and use the wireless charger at the same time. The RAVPower Wireless Charger has an LED light on the side to show its status, but with the phone on top of the pad, it isn’t very noticeable or too bright at night. The charger also has a cooling fan built-in which is very quiet. Overall, I’m very pleased with the RAVPower Quick Charge Wireless Charger RP-PC014 and I would recommend it to anyone looking for a wireless charger on a budget. Purchase the RAVPower Quick Charge Wireless Charger RP-PC014 on Amazon now for $17.99 with Prime.